On January 3, 1957, Capt. 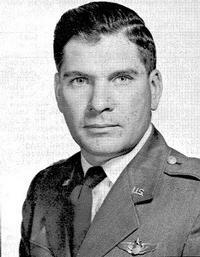 Wayne W. Eggert, USAF Experimental Test Pilot, died in the crash of an H-19 at the Air Force Flight Test Center, Edwards Air Force Base, California. Capt. Eggert was considered by many to be the foremost helicopter test pilot in the nation. His contributions through flight test to the rotary wing industry have been outstanding. A pioneer of helicopter test work by the Air Force, Capt. Eggert's name has been synonymous with helicopter flight testing for many years. Following completion of pilot training with the US Army Air Force in February 1945, Capt. Eggert entered the Air Force Helicopter School at Shepard Field in Texas and received a helicopter rating in May 1946. His 39 hours of rotary wing training was given primarily in the Sikorsky R6A. His first assignment was to Okinawa as a maintenance officer. Upon arrival he found little interest in the helicopter, in fact the R-6As assigned to the base had gotten no further than the beach and were still crated. With two aircraft in commission and the rest being used for spare parts, Capt. Eggert initiated helicopter operations in this area and proceeded to prove to the skeptics the value of the helicopter as a rescue vehicle. After cogging514 hours of rotary wing time in this tour of duty he was assigned to Wright-Patterson Air Force Base in October 1948 as an experimental test pilot. In the years that followed, Capt. Eggert distinguished himself as a test pilot and gained the highest respect of the rotary wing industry as a highly qualified and often stern judge of helicopter flying qualities. While at Wright Air development Center he conducted Air Force Phase II performance and stability evaluations on the H-5H, H-13C, XH-12, YH-19, YH-10, HRP-1, YH-23 and YH-18A. He also served as test pilot on many rotary wing projects for the Wright Air Development Center Laboratories. As a fixed wing pilot Capt. Eggert was also considered among the best in cargo and liaison aircraft and served as project pilot on several fixed wing test programs while at Wright-Patterson Air Force Base. While at this center Capt. Eggert completed the performance and stability course in the Air Force Test Pilot's School. Following transfer of the majority of the Air Force's flight test activity from Wright-Patterson Air Force Base to Edwards Air Force Base, California, Capt. Eggert was reassigned to Edwards Air Force Base as an experimental test pilot in December 1952. During his test work to this date he had accrued a total of 1650 hours of helicopter time. Capt. Eggert continued his test career by conducting performance and stability tests on Vertol's H-25A and YH-21 in 1953. As a result of this work, testing of later models of the H-21 and his recent testing of the H-21 at extreme gross weights, Capt. Eggert was considered a leading authority on tandem rotor flying qualities. He also participated in the Air Force's evaluation of the YH-16 and has made evaluation flights in Bell's HSL. Because of his broad background and exceptional ability, Capt. Eggert was utilized extensively in Air Force Phase II evaluations which are brief first looks at new aircraft usually at the contractor's plant after limited testing by company test pilots. He was well known at Sikorsky having conducted Phase II evaluations on their H-19B, H-34A and H-37. Most recently, Capt. Eggert received considerable publicity for his brilliant flight testing of McDonnell's XV-1 convertiplane. He is unofficially given credit for having set a new rotary wing speed record by flying the XV-1 at 200 MPH. His skilful evaluation of this aircraft to determine its maximum potential is credited with giving the convertiplane the greatest boost since its inception. As a fixed wing test pilot Capt. Eggert also distinguished himself. During testing of the C-124 and recently Lockheed’s YC-130, he demonstrated the same piloting ability which has immortalized him as a helicopter pilot. During his career Capt. Eggert has, in addition to his test duties, been called upon many times to perform rescue missions by helicopter. He was awarded the Distinguished Flying Cross for his rescue of an injured hunter from a small meadow at this base of Mount Whitney. On this mission he flew an H-19B over the inaccessible Sierras, landed in an impossibly small area at the 9000-foot level and then made an extremely hazardous take-off to carry the injured man to safety. Capt. Eggert had also done some flight evaluations for the Army at the Army Aviation Center at Fort Rucker. During trips to the center he had flown Bell's HSL, Doman's H-31, Cessna's H-41 and the Kaman HOK. He was highly respected in all Army Circles. During his brief career Capt. Eggert flew more than 20 types of helicopters and accumulated almost 2800 hours of rotary wing flight time. In 60 types of fixed wing aircraft he had flown a total of over 4000 hours. Words cannot express our regret at the loss of this pioneer of our industry. The results of his devotion to his work is best described by the comment of the pilots who flew with him -- "There was none better.